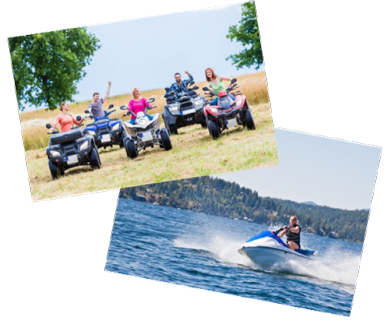 Hit the open road on your new motorcycle, explore the unpaved land on your new ATV or cut through the waves on your new Jet Ski. Whichever your preference, don't let money hold you back. LZECU can help get you a loan for your recreational vehicle with a wide variety of terms to help you get out and about quickly. Do your homework by making sure you're getting a fair price using the NADA Guide. Should you take advantage of low interest dealer financing or credit union financing combined with a manufacturer rebate. See what rate and term is right for you by checking our competitive rates. Or give us a call at 800-477-LECU, or stop by our branch location to apply for your recreational vehicle loan today.